HTC Desire HD Android 2.3.5 Software Update, Available for Download! Confirmed! One of the things (among so many) that I love about HTC is the fact that the company is always mindful of their loyal consumers - even those who purchased their handsets more than a year back. Case in point: The Android 2.3.5 firmware upgrade that's coming to HTC Desire HD. In fact, the company has just started rolling out the update in various territories. So if you're one of the millions who own this phone, you can check if you can already download the latest version of Android Gingerbread by going to Settings, About Phone, System Software Updates then clicking on the Check Now button. Don't feel bad if you don't immediately get the notification; HTC is releasing the software upgrade by batches so it will definitely come to your phone -- sooner or later. So what does this upgrade bring to HTC Desire HD? Slightly longer uptime, faster performance, improved task manager, no-root screen capture (home button plus screen lock button), and sleeker user interface. One of the best-selling phones of HTC, HTC Desire HD was the company's flagship handset for the latter part of 2010 until the first quarter of 2011. During its release, the handset - wrapped in a stunning unibody aluminum case - donned the nothing but the best technical specifications that HTC could deliver at that point, including a 1 GHz processor, an 8 MegaPixel camera with dual LED flash, and a high-definition 720p video recorder, among others. Android 2.2 Froyo was the operating system of HTC Desire HD during its launch in the Philippines in December of 2010. 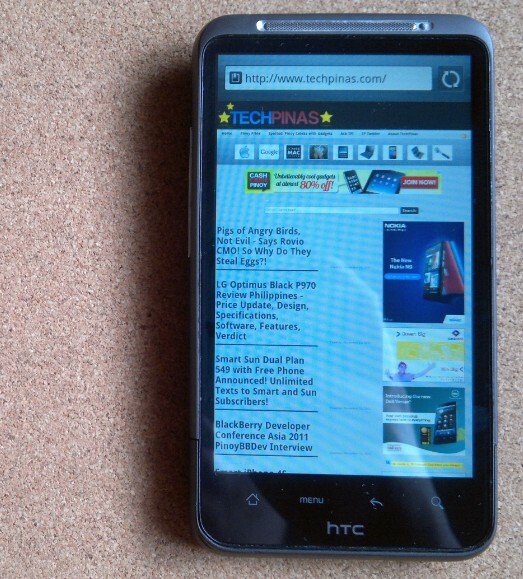 Also, as some of you know, HTC Desire HD was one of my everyday phones for the first half of 2011 -- along with Nokia N8.